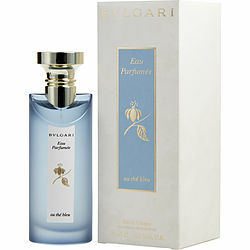 Step out with confidence when you wear Eau Parfumee au the Bleu, a unisex fragrance by Bvlgari. Created in 2015, this fragrance combines the perfect blend of sweet, floral and musky tones to beautifully enhance your natural aroma. Top notes of lavender and shisho give the fragrance a clean, fresh scent that gets your day off to a great start. Violet lends a mild powdery scent to the fragrance, while the tea note makes it slightly minty. Musk rounds out this fragrance, giving it a sensual appeal that's perfect for the evening. Eau de Bleu smells great. Good for Fall time.